Is the infographic even accurate? If so is the conclusion it's pushing backed up by valid statistics? (that there's a clear correlation between the gun problem (as defined by firearm deaths per 100,000 people) and Democratic-party voters? Or is it more of a case of cherry-picking specific areas that fit the desired pattern? 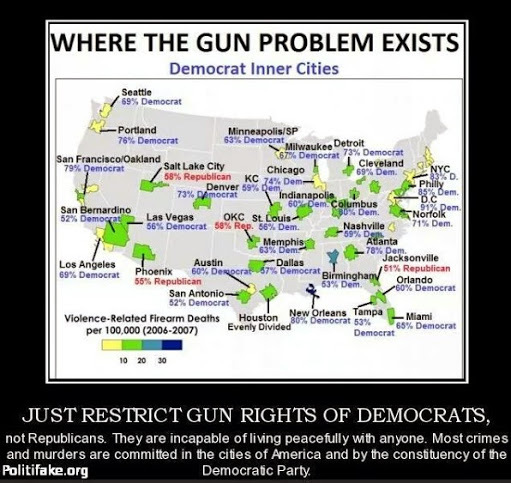 The info-graphic says there's a problem in "Democrat Inner Cities". Apparently, inner cities in general are Democratic. Princeton's Robert Vanderbei put together a fantastic 3-d map in 2012, which I'd recommend that you take some time to explore, that visualizes the country with blue skyscrapers towering over pink plains, reflecting the heavy concentration of votes in urban areas. Violent Crime and Murder in America Blame Democrats! That being said- inner cities are not Republican strong holds regardless of the state. Please note that even in red states (Republican states)- the inner cites are voting in high numbers for Democrats. Do you think the residents of Los Angeles, Chicago, Detroit, Cincinnati, New York, Philadelphia are voting for Republicans? They are voting in much higher percentages for Democrats. I am making a blanket statement- but the percentages back this statement. As a result- it is fair to say that most crimes and murder in America are being committed by Democrats - because the percentages of Democrats in these areas far exceed the number of Republicans. So the correlation is, "Cities (urban voters) are Democratic" and "Inner cities have (gun deaths) violence". I don't think this is evidence that the (relatively very few) murderers themselves (less than 1% of the population) vote Democratic or Republican; so I don't see a connection between "voting Democratic" and "gun crime", except that both (voting and crime) happen in (all) cities. First, the American firearm-deathrate according to this table is 10.1 per 100,000 people, but the yellow swatches in the Infographic are, according to the legend, areas that have less than that rate. Conversely, the entire states of Lousiana, Alabama, Mississippi, Wyoming, Montana... well, actually, 30 entire states ... should be colored in green (indicating above-average deathrates). Alaska, which has a statewide deathrate of 20.4 per 100,000, should be in pale blue. The infographic may still be true, since it may be that the areas in the infographic are very violent places in an otherwise tranquil sea of peace and love, but the lowest-deathrate states (including the NY/NJ/CT tristate area and Massachusetts, despite the graphics highlighting them) are considered liberal / Democratic. So it doesn't seem all Democrats "are incapable of living peacefully with anyone". Perhaps the creator of the Infographic was trying to create an argument, not so much about political affiliation, but some other characteristic. I wonder what characteristic a person spewing agitprop about "Democrat inner cities" could mean? Not the answer you're looking for? Browse other questions tagged united-states politics guns . Is the Windows 10 upgrade event the largest upgrade event? Is there a positive correlation between number of sexual partners and likelihood of failed marriage in the United States?